Garden spiders are found essentially anywhere outdoors. These spiders possess a unique color compared to other house spiders. Garden spider skin color is an abstract yellow and orange, differentiating itself from other colorful spiders. The web pattern also separates the spider from other outdoor spiders. Instead of messy web patterns, the garden spider has a orb-shaped pattern capable of being strung across a whole yard. Interestingly, baby garden spiders have the ability to cast these abstract web cobbs anytime. 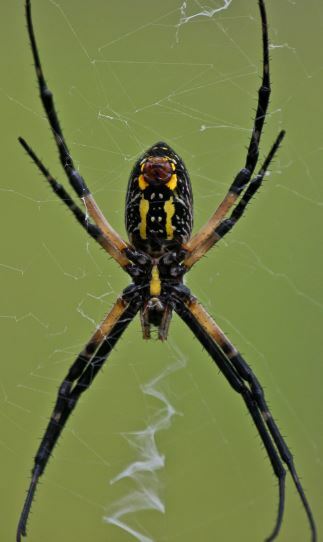 Other names for the garden spider include, black and yellow spider as well as argiope spider. Garden spiders are known for their intricate “orb-like” web pattern able to withstand heavy insects. The diameter of the spider web can be as big as two feet with a unique zig-zag like pattern in the middle attracting insects and deterring birds from flying through with a visual stop sign. The web is a lot more organized than the black widow’s. Even from the birth of a baby garden spider the ability to create perfect spider webs is available. Garden spiders love any outdoor place with sticks, bushes, trees, leaves, or twigs they can use to build web cobb networks. Like many other spiders, the garden spider uses it web to entrap and eventually kill any insect prey it comes across. Many times you will see the garden spider set up it’s large, strong web near bushes or trees as it allows a stable area for silk webs to be stand strong as well as protect themselves from strong winds. Call (925) 329-3366 for garden spider exterminators! Upon the prey getting caught, the internal system must be flushed with digestive enzymes before the spider can consume the prey. Instead of eating the prey caught, the garden spider will essentially drink and leave whatever remains are left. Like the black widow spider, the vision of the garden spider is poor and uses the web vibrations to detect any movement worth paying attention to. Often times, the garden spider has the ability to consume larger insects than itself, like the preying mantis. The preying mantis normally would consume the garden spider but the stealth intelligence of the garden spider would wrap up any insect attached to it’s web and kill. Autumn is the best time for garden spiders to lay fertilized eggs. Egg sacks are created to lay anywhere between 60-several hundred garden spider spiderlings. The silk holding together the baby spider eggs is powerful enough to withstand strong weather changes and any predators. When springtime rolls around the unhatched garden spider eggs come out and escape into nature. After laying the eggs the female garden spider will often times die, leaving the baby garden spiders open to attack. Garden spiders are harmless when it comes to spider bites. Unlike the black widow or bee sting, the garden spider will rarely ever bite. If bitten by a garden spider it would be due to intruding on eggs or disturbing the spider web network. No serious medical attention would be needed for a garden spider bite. Garden spider bite symptoms may include a little bit of swelling and discomfort that would not be anything like a serious attack.